Yellow tea 黃茶 usually implies a special tea processed similarly to green tea, but with a slower drying phase, where the damp tea leaves are allowed to sit and yellow. 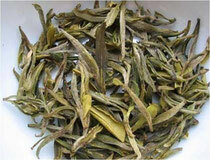 The tea generally has a very yellow-green appearance and a smell different from both white tea and green tea. The smell is sometimes mistaken for black if the tea is cured with other herbs, but similarities in taste can still be drawn between yellow, green and white teas. It can, however, also describe high-quality teas served at the Imperial court, although this can be applied to any form of imperially-served tea. Yellow tea is not a new fad, it goes back 4000 years in China! Yellow tea often used to be reserved for Chinese emperors' very own consumption. 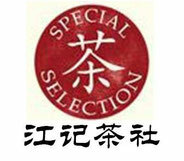 Yellow teas are a rare category of semi-fermented teas only produced in China. 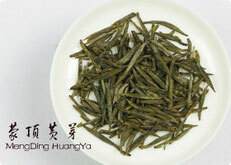 Most Yellow teas are made in Hunan, Anhui and Zhejiang; smaller amounts are produced in Sichuan and Jiangxi. 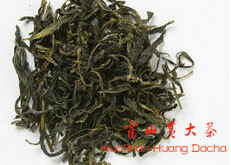 is a Yellow tea from Junshan Island of the Hunan Province in China. 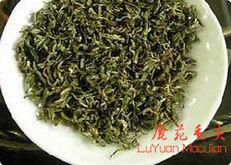 It is one of Chinese Famous Teas. Although the same kind of tea trees are also planted around Dongting Lake, where Junshan Island is located, those teas should not be called Junshan Yinzhen. 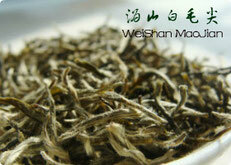 The tea resembles the White tea Yinzhen known as Bai Hao Yinzhen. 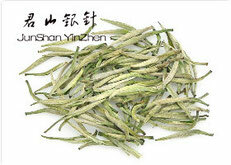 Junshan Yinzhen, allegedly the preferred tea of Chairman Mao, is a rare tea sometimes sold as White tea. 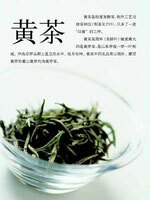 is a yellow tea from Anhui Province in China, it is the Imperial Tribute Tea and dates back to the Ming Dynasty. 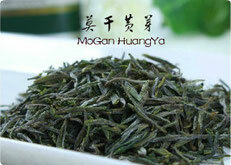 The dry tea leaves have a shiny appearance and are very similar to Huang Shan Mao Feng tea. 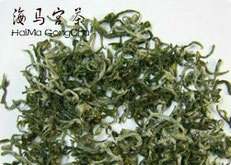 When steeped the leaves reveal a very peppery and fresh taste accompanied by an unusual green-yellow color of the brew. As with all mostly bud teas the color and fragrance are slight. 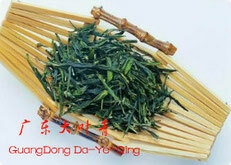 Meng Ding - (cloudy peak) carrying name "The best under the sky" is famous yellow healing tea from the Meng Ding mountain of Sechuan province. In the old times it was used in the imperial court during the ritual of sacrifice. Expressively delicate flavour of this tea is highly valuate. 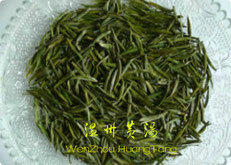 Traditional yellow tea areas produce yellow teas using small leaf green tea bushes. 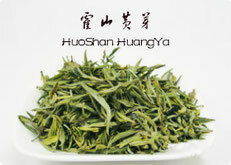 Whereas green teas are quickly dried after firing, yellow teas are piled and partially fermented after firing and prior to the final drying process, in order to remove grassy and sharp notes common in green tea. The unique yellow tea pile fermentation process converts tea polyophenols into complex tea polyphenols known as “theaflavins,” which yield a yellow pigment in the leaf, creating a golden infusion. Tea, throughout history, is typically classified by color. The six major tea categories include green, yellow, white, oolong (blue-green), red and black teas, so the name ‘Yellow Tea’ is fitting for this category since it is a semi-fermented tea with a golden yellow infusion color. Yellow teas are famous for their smooth, savory, sweet and unique fruity and fermented aromas, and have similar antioxidant health benefits to green tea but with a smoother palate. 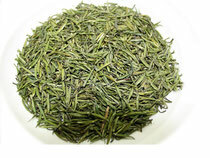 They are a great choice for green tea lovers and newcomers to our organic tea offerings. 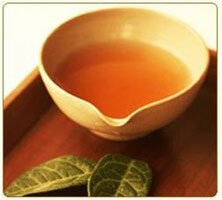 Yellow tea is classed in the same category with white tea because it is very lightly oxidized. One of the objects in making yellow tea is to remove the grassy smell of green tea while still maintaining the health qualities of green tea, and yellow tea is felt by some to be even healthier because it is easier on the stomach than green tea.Yellow tea— a tea good for your stomach; it helps lose weight, and is good for your stomach.